In this tutorial I’ll show how you can create your own LED Cube 3x3x3. I’m sure you’ve already seen some similar projects to this one but you never took action and made your own. Now it’s time to make your own! IMPORTANT: You need to download an older version of the Arduino IDE in order to compile/upload the LedCube Library to your Arduino board. Go to this page and download version 1.05 of the Arduino IDE for your operating system https://www.arduino.cc/en/Main/OldSoftwareReleases#previous. If everything is correct you should find an example in the Arduino software under File > Examples > LedCube > ledcube. If you like LED cubes, you may also like how to build an 8x8x8 LED cube using a DIY kit. You can read the full instructions here. Thanks for reading, you can contact me by leaving a comment. If you like this post probably you might like my next ones, so please support me by subscribing my blog and my Facebook Page. do you think the implementation of the program could be similar to 3x3x3? The idea/concept is the same… but you should start to understand how a 3x3x3 works before you go into a 8x8x8. Check my friend LED Cube. he has a awesome tutorial! bro…would you plz provide code for 3x3x3 cube..
And the code will unlock for free! what shuld i do with this??? You need to install the LED cube library properly in your Arduino IDE. I hope you make one of these too! I hope you make one LED Cube too! Hi, I’m from Malaysia. Nice stripboard gripper. Only use crocodile clip and hardwire. Why I couldn’t thinking of that idea. Thanks! It’s a good project that you can complete in a few minutes. and It’s made with parts that you probably already have laying around. So feel free to make one! hi.. can you give the code you have used?? Yes you can download all my code for absolutely free… just share this post, and the source code will unlock. or simply enter your email adress and you’ll access a secret page with all the source code for my projects! Hi, thanks for taking the time to download my projects! you don’t need to change the code. What you’ve downloaded is not an Arduino sketch. It’s an arduino library. You need to move everything into the libraries folder of the Arduino IDE. And then open the Example in the Arduino IDE. I hope this helps and let me know if this worked for you. Do you need to download any sort of software for the arduino board to work and to make different patterns. If thereis can you please write what the software is called. No… It’s all done in the Arduino IDE. You need to change to code and do whatever pattern you want. Simply download the library and move the library to the Arduino IDE libraries folder. And change the LED Cube example. Thank you that helped. Another question, what 3 things do the transisters connoect to? Parabéns! Este projecto está muito bacano e o software está escrito de forma fantástica. I will keep it in English for the sake of your site and future visitors. I was looking in the code and i couldn’t find where did you define the output level for the pins? I would like to adjust it a little bit, as my cube flashes very dimly..
Muito obrigado por testar o meu projecto. thanks so much for trying my project. And I know you already figure out the problem! Ignora o meu comentário…. Estava a ulitizar os transistors errados. the code which i had downloaded from this website is not working it is having some errors like cubeFrame was not declared in this scope?,expected primary-expression before ‘]’ token? after importing the libraries also…kindly revert us with the solutions as soon as possible. try to download the Arduino IDE again and insert the library. (After you download this library. Extract it, change the name of the folder to something like: LEDCUBE, (it can’t have the slash: “LED-CUBE”, the arduino tells you that). then move that folder into the Arduino libraries folder. It works for me and for at least 50 people that tried and sent me pictures of their LED cubes with this exact code. Let me know if you could make it work. Hi, i build today my first cube and cant get ur code running i got multiple error messages. I also reinstalled the Arduino IDE again. and if i use an another code just the last three colloms of my cube are lighted up maybe u could help me to finde the fail. If it help i can send u pics of my board and the wire. Seems like you’re not installing the libraries properly…. Download the latest Arduino IDE. Then download the arduino library. Move that folder to the arduino IDE libraries folder. Go to the examples > ledcube. Please send me a picture of your LED Cube I would love to take a look! Thanks, Merry Christmas for your too! Eu conectei todos os fios nas saídas digitais do Arduino e liguei ele, todos eles foram acoplados ao Cubo3x3. Depois disso a saída 12 até a 2 parou de funcionar. As luzes estão piscando normalmente (a ON e L) e a parte de Power também está funcionando. Não sei porque quando conecto um led, tanto faz se é a perna negativa ou positiva nas saídas que não estão funcionando e uso o meu corpo como GND ainda consigo ver uma pequena luz nele. Será que as queimei realmente? é bom para começar a aprender a sintaxe e como funciona. Depois existem imensos livros, eu pessoalmente estudo melhor por video e tutoriais em texto online. Obrigado por deixar um comentário e experimentar o meu projecto. O seu cubo está a funcionar bem, certo? quando você agarra o LED com a mão, o seu corpo faz de ground e completa o circuito e acende o LED um pouco. Isso é normal, assim como você bem disse que era isso que estava a acontecer. Por isso parece-me que o seu arduino está a funcionar bem! Mas experimente o programa exemplo do blink LED nos vários pinos digitais só para ter a certeza se está tudo bem. Hello…could you tell me wich one is the first layer? the…first…from down to up…or the first one…from the top? The first layer is the bottom one. the third the one on the top. that’s awesome, if you have some time please send me a picture of your LED Cube. or any other filesharing service. You can either download the code by clicking one of the sharing buttons on this page. Or simply go to this page enter your email. and you’ll have access to the secret page right in your email. If you have any problems just let me know! Could you please just email the code? I am having problems unzipping it into Arduino library. Thanks for your speedy reply Rui! I meant by a .txt or .rtf file of the code, or is that not how it is written? I think you already fixed that, right? I’m tested your cube led 3x3x3 with BC547B but dont’t work correctly. When i’m weld level 1, 2, and 3 directly on level structure, it’s work. Why ? There is a diffrent between 2N2222 BC547B. I have another question. The function lightPulse(1, 0, 100) for example. Switch off the light on level 1 (middle), column 0 (corner) ? or switch on ? thank you. Sorry for taking so long to answer I’ve been pretty busy this week. I solved my problem. When I passed by the transistors nothing worked. When I welded the pins 11, 12 and 13 directly to the respective levels, it worked. I badly welded ground and a transistor. Now it’s perfect ! But I’ll use port method (http://graoulab.org/wiki/index.php?title=Cube_LED) to make larger cubes. Thank you. I’m glad you found a solution and made it work! Its brilliant, everything is ready, only the leds have to be connected to the right pins!!! It looks really cool Satvik. a didn’t know how to solve it, please help. Please reinstall your Arduino IDE and try to install your library again. but got no error with Arduino IDE 1.5.2 and Arduino IDE 1.0.3. I didn’t know how to solve it, please help. It seems to be caused by a compiler change or something in the 1.5.8 version of the arduino IDE. I’ve “fixed” to problem by replacing these lines (48) . I know it’s kinda ugly but I’m not that good at c++ to make a nicer looking solution. The main cause of the problem is the unability to point to temporary created variables, so creating real variables is an easy way to fix it. It’s works! Thanks a solution! Thanks for trying! I’m glad everything worked smoothly! Yes, some people that have reported issues didn’t install the LED cube library properly, so they can’t compile their sketches. But if you do exactly what I show in the blog post it will work! Thanks for your feedback Andras. Feel free to post a photo of your LED cube! Reinstall Arduion IDE, with erase data from Arduino folders, didn’t help me. Problem solved, i’ve run Arduino IDE on linux distro. , but when i run in virtualBox with windows XP, all it’s all right. Excelent tutorial, thank you. 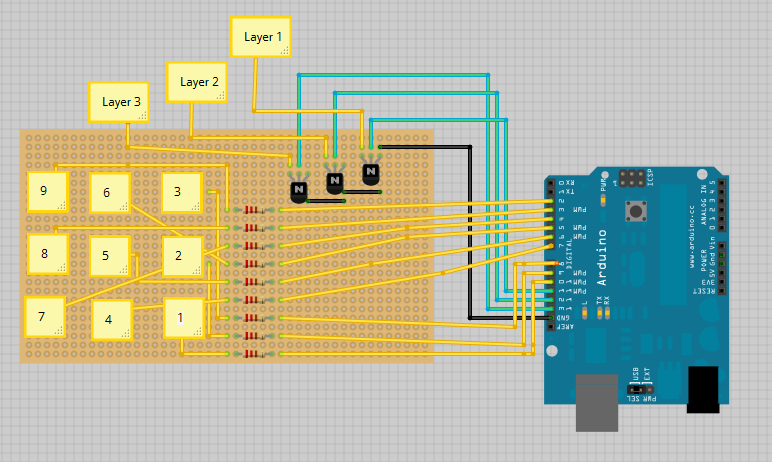 I have a question though: Why do you use transistors for the ground instead of connecting directly to the arduino pins? I recommend you to search first how transistor works. Seems that you have not installed the arduino library properly. Please download the Arduino IDE again and the LED Cube library. And move the LED CUBE library to the arduino libraries folder. how is the library folder called? Remember that i can’t have any “-“. For example if it’s called, led-cube. The Arduino won’t recognize the library. But the Arduino will tell you. I am beginner in this, so I don”t know what kind of Arduino board should I buy, and what kind of wire. If you want to start learning Electronics with the Arduino. I recommend you to buy an Arduino Starter Kit with an Arduino UNO board. That’s an easy way to get started! I also recommend you to start with a easier project. Best place to search for arduino project Arduino.cc, instructables.com or youtube.com. Some kits bring a getting started book that will help you a lot. heyy. i have a question. i am no user of arduino board. if we create this project together with my group. is’t easy to implement this without having a experience on using arduino? But have you ever made any electronics? Like creating circuits, soldering… this means, do you know the basics? Hi, thanks a lot for you tutorial it was very helpful! Does the process change if I use a perfboard instead of a strip board? Could you also tell me where I should use the 22k ohm resistors, I don’t see them anywhere no the diagram. You should use a perfboard actually. It will work just fine . That’s a really good question I never noticed I forgot to add the 22kohm resistor in the circuit diagram. Se me pudesses ajudar agradecia. O problema é nao ter instalado a biblioteca do arduino corretamente. Tente fazer download da versao do software do arduino mais recente. Faça download da bibloteca que eu pus aqui neste post. e mova essa pasta para a pasta libaries do Arduino IDE. Reinicie novamente o Arduino IDE e deverá funcionar corretamente. Fico contente que tenha funcionado ! where do the 22kiloOhm resistors go on the breadboard? I see where the 220kilo Ohm resistors get attached to but I can’t see where the other resistors should be placed. I forgot to add them to the schematics. Sorry they go to the Digital pins 11, 12 and 13. Hello, I am a beginner and would like to build a cube. Can you tell me where the 3 resistors > in the schematic they are unrecognizable? What LEDs did you installed? What voltage are applied to the LEDs >> how can I calculate the resistors? My LEDs are these >> htp://media.highlight-led.de/products/documents/pdf/26000092.pdf. What resistors should I take since? The resistors I’m using should work just fine with your LED’s because I was using 5V LED’s and you’re also using 5V led’s. Hello, I´ve tried download and open that files, but when I verify that that on line 50-60 line writes error, can you help? Make sure you have the latest arduino IDE. And make sure you install the library on the right folder! Hello. I want to make a 3x3x3 led cube with atmega8. Could you do a video how to do cube like that, and how to code atmega8 with arduino, please? Hello Rui. Im looking for something like you posted, but its with really weird code. im looking for code which is .c or .hex, for atmega8 microcontroller, because i don’t know how to upload that code..
you can find them on Amazon or ebay! Hey thanks for this tutorial! I am almost done, I just have one problem. My leds flashes very dimly. I dont know what the problem is. From the comments above, they have used the wrong transistor for this very dim flashes, but I am using the 2N3904. Thank u m8, u helped me to make my own led cube. I’m thinking about building a LED-Cube for a long time now. Finally I found your website and will start pretty soon. So first of all: Thanks alot for your awesome work!! In your Tutorial you write that you use “27 LED’s” and “9 x 220 ohm Resistors”. But what kind of LED do you use (max. U and I). Is it correct, that there arduino uses a 5V output, so that I can calculate the necessary I of the LEDs? Thank you alot in andvance for your help! i followed your instructions and i got 80% done. Some leds are not light up and i don’t know why, does it caused by the code or something? My English not really good 🙂 thanks! Something missing during the soldering job. Thanks for trying my project! You have to install the LED Cube library properly in your Arduino IDE folder. hey rui….the 2th layer doesn’t lit up.. but the first en third ..and some leds light up…what seem to be the problem? can’t find my mistake .. is it the code of the arduino? Have you checked all the connections with a Multimeter? Do you have all your LEDs soldered properly? i built a final year project so i choose to built 4x4x4 and have a music. so can i just replace the arduino using rapsbery pi? No, the Raspberry Pi is not a good option to make an LED. Do you have any extension in your web browser that might cause blocking download links? Thanks alot for the tutorial! I am super excited to work on this project myself however I am confused about the size of the stripboard I should buy. The most common ones I’m seeing on ebay are 94mm x 53mm. Will that size be enough for all the components to fit? I also saw a 90mm x 70mm. Also, I would like to mention I will be doing a 4x4x4 not 3x3x3. If you want to build you should follow another tutorial for your particular needs and components. Or you can try to modify mine to work for you. I did it !!! And it’s amazing! Thank you, it’s a great idea!I would like to show, but do not know where to send the video, if you want to see, tell your email address. any ideas whats wrong ?? I get the same error. Have you sorted it yet? Nothing i do seems to work. I would use a different code however my build is for that code. Rui, any ideas how to fix this?? Try with an older version of the Arduino IDE. Go to the ARduino website and download a version 1.01. I just finish set up 3x3x3 LED Cube but i got a little problem with code.. I am download your code and I try to fingure out what is error I am getting.? When I look for getCole . I think its not define mean. Do you know getCole mean? Make sure you install the library properly and restart your Arduino IDE. You can also try with an older version of the Arduino IDE. Go to the ARduino website and download a version 1.01.
taking address of temporary array could you help me please? Try to upload the sketch using an older version of the Arduino IDE as I recommend in the blog post and make sure you install the LED Cube library properly. Thanks for your answer Rui! I finished the led cube i linked everything properly but i send the code to the Arduino nothing happen! so I don´t have an idea what to do, I followed your steps but it dosn´t work. Are you using a older version of the Arduino IDE to compile your code? Have you double checked that you installed your library in the right folder? I am using the version 1.05, yes I think I installed the lybreries in the right place. can you show me full map? I don’t know how can I make without circuit map? I don’t have that prepared. Hello guy, with which programm do you make the schematics? Which programm do you use for programming? Is it possible to programm it with Energia? Have a nice day! Cheers. It was uploaded using Arduino IDE version that is described in the blog post, I’ve never used Energia. Thank you for reading Ed! how to unzip to arduino libraries folder? How big should the stripboards be for this project? It depends on your LEDs size… You need to measure how much space will your LEDs use. Thanks for asking! Hello dear friend, thank you very much for the video you created. I built my cube and I only have trouble with code. Please explain very clearly about compiling. The other question I had was how to install the libraries of the cube? This project was created a few years ago. So, it is a bit outdated. Then, you should find the code in your Arduino IDE under File > Examples > LedCube > ledcube. I haven’t tested this and I don’t know if this is still working. But these were the instructions we’ve followed a few years ago.